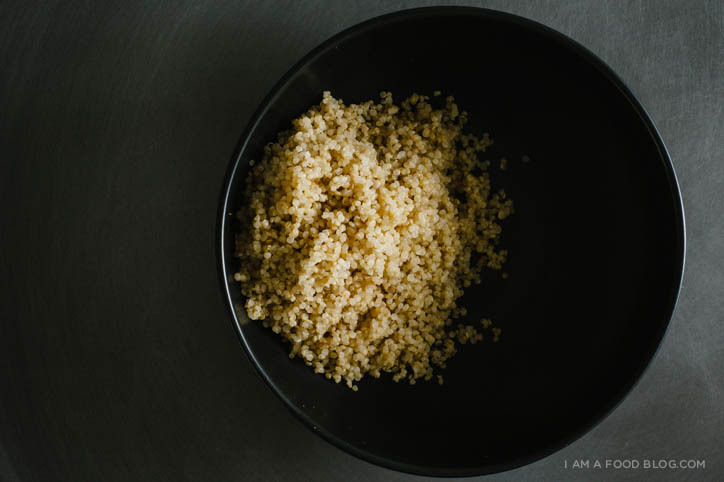 Do you remember the first time you heard about quinoa? I was one of those people who totally thought it was pronounced “kwin-NO-ah.” But after a couple of confused looks, I started saying “keen-WAH.” To this day I still have no idea which way is the correct way, but everyone seems to say “keen-WAH,” so I go with that. Confusion aside, quinoa is one of my favourite grains. It has nothing to do with it’s healthiness and everything to do with it’s deliciousness. I love it’s fluffy, nutty texture. Quinoa is super versatile – it’s used in pancakes, cookies, soups, stews, on its own, and of course, in salads. I like cooking up a big batch in my rice cooker and then just throwing in whatever happens to be in the fridge. While this has resulted in some truly excellent combinations, sometimes I want something more thoughtful and composed. 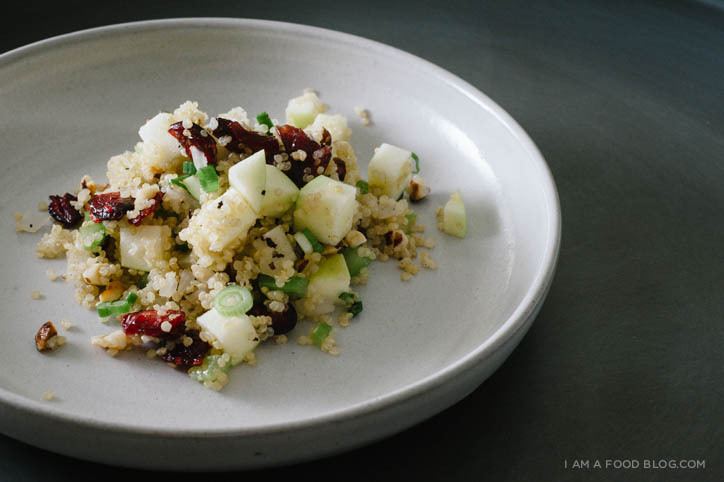 I came across a quinoa salad with hazelnuts, apple and cranberries recipe on Food52 and I actually had all the ingredients. It was meant to be! I love nuts in salads, but hardly ever use hazelnuts, which is strange because hazelnuts are in Nutella, and who doesn’t love Nutella? 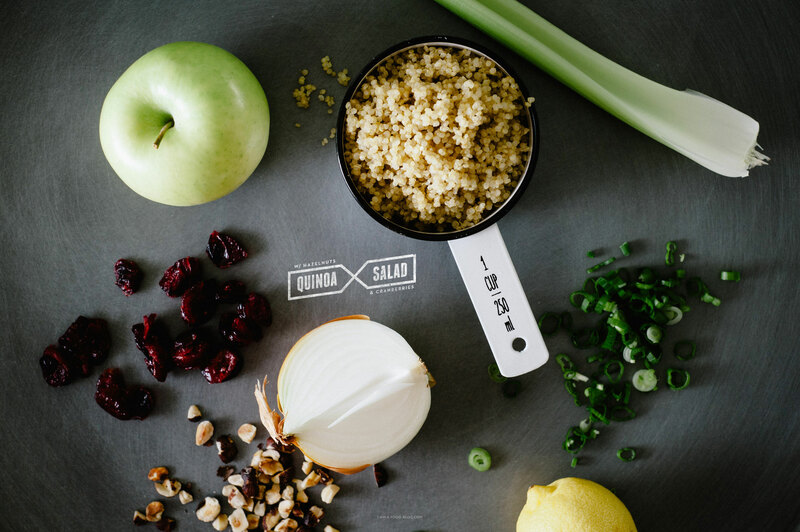 This is like the Nutella of the Quinoa Salad World. The crunchiness of the nuts with the just cooked onion and celery pair perfectly with the crisp apple and chewy, sweet cranberries. 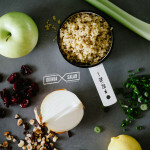 It has a simple lemon and oil dressing, which is all it really needs — the flavours of the components really shine through. 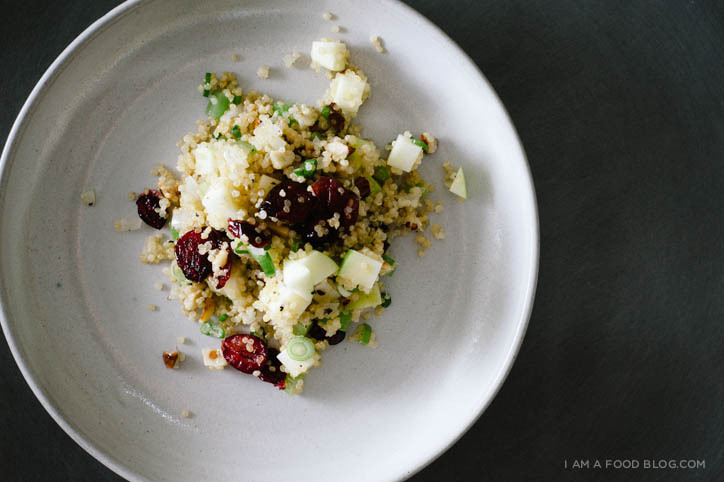 This salad feels a bit more fancy than your usual quinoa salad and I can totally see it as a side at a holiday table. When you have a bunch of super rich and heavy dishes, sometimes it’s nice to have something slightly tart and fresh tasting. Heat a skillet over medium low heat and add the oil, onion and celery. Cook until just tender, without browning. Season with salt and pepper to taste. 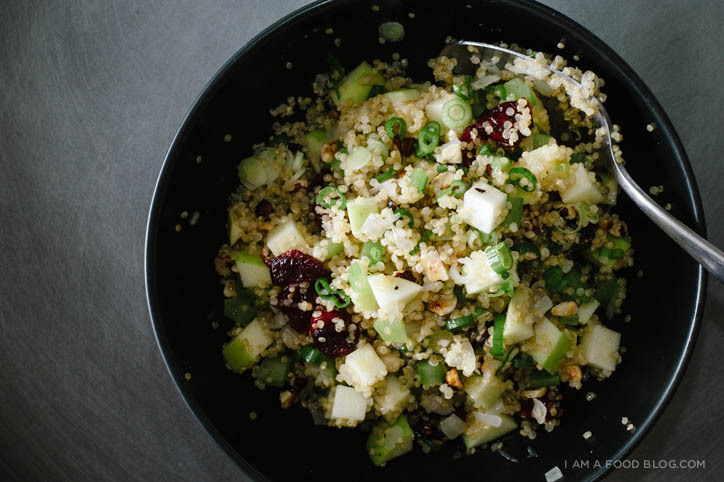 In a large bowl, toss the quinoa, onion and celery, toasted hazelnuts, green onions, apple and cranberries. Squeeze lemon juice on, drizzle with a touch of oil and season with salt and pepper. Mix well. Allow flavours to meld for 20 minutes and enjoy. I love quinoa too (and totally used to pronounce it “kin-oh-ah!” but I’m pretty sure “keen-wah” is correct) My issue is my family gives me the side-eye whenever I serve it; slipping it on to the Thanksgiving table in this recipe would be a great idea. 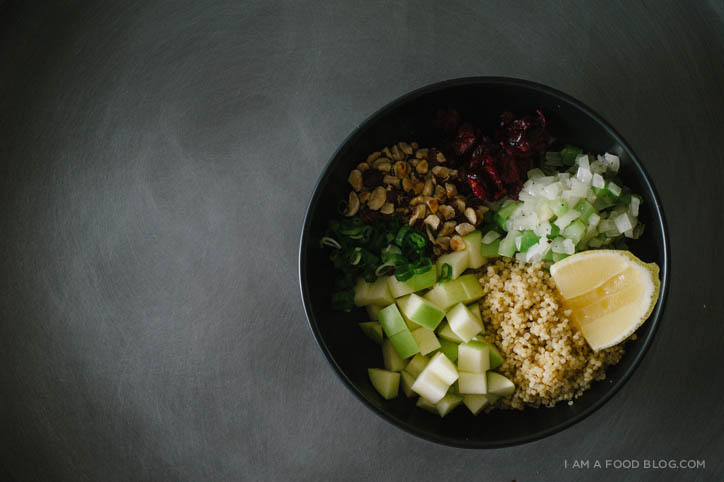 Quinoa is great for salads because it fits so well with lots of ingredients, but the other day I wanted to make a salad like this and realized I had quinoa, but that was just about it. I cooked it using veggie bullion and it was amazing! This looks amazing, really simple to put together but really nice. This sounds like a great combo! I wanted to make a quinoa salad for a potluck where someone is on a gluten-free diet. I have most of these items in my pantry already so this will be perfect! This salad is amazing! Very easy to prepare and tastes sooo good.